A conglomeration of Dietrich students, faculty, and staff filled the Adamson Wing of Baker Hall last Wednesday to hold a town hall on the future of humanities at Carnegie Mellon. The event was a discussion on what it meant to be part of the Dietrich community, and how the members of the college wanted themselves viewed in the eyes of others. 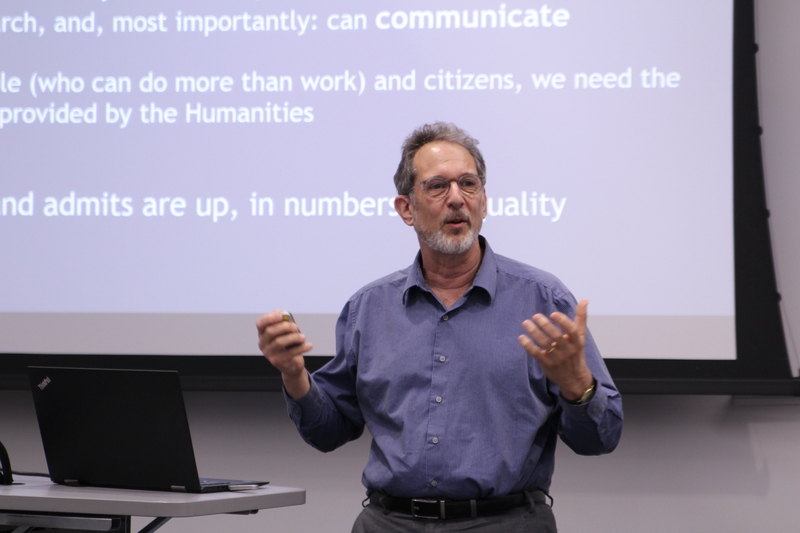 Framing the town hall, Dietrich College Dean Richard Scheines described the improving state of Carnegie Mellon’s humanities, with a 56 percent increase in Dietrich as the first-choice college among enrolled students within the past two years. However, this was against a backdrop of a national decline in humanities students since the Great Recession. “When people come to think about college, they [are] very anxious about jobs and they don’t perceive that the humanities are the right way to get yourself a job,” said Scheines. The town hall laid out two strategies for enhancing the humanities’ presence and recognition on campus. The first approach integrates humanities with popular disciplines; the second approaches it as “supporting humanities qua humanities,” looking to advance more internal humanities efforts by building off humanities departments within Dietrich. In the breakdown presentations, head of the philosophy department, David Danks, explained that philosophy asks the foundational questions of human experience, building upon the intellectual history of the discipline to answer contemporary questions through an interdisciplinary lens. Reflecting the national conversation, there was also an emphasis on the importance of the soft skills. Department of English head Andreea Ritivoi stated that while technical majors have higher earnings upon graduation, this overlooks earnings over time, which is where soft skills have the greatest impact and where her department can impart these skills to students across colleges. Student presenter Emma Flickinger’s Tartan article “Humanities fall by the wayside at CMU” helped catalyze the town hall. She states that because Dietrich students were outnumbered overall, humanities students are often outnumbered in humanities courses to students from other colleges taking something as a general education requirement. “It can be demotivating when there’s something you want to devote yourself to... and in your class the other students see it as a fun extra,” she said. When class rigor was brought up during the discussion, this frustration was echoed by others. “The rigor isn’t higher in certain classes, not because of class difficulty, but because we have so many people who don’t have basic fundamental skills – and the level of discussion just goes down because of that,” said Maggie Mertz, a senior global studies and creative writing student. “You know the one class [first-years] hate more than anything? Interp,” Mertz continued to murmurs of agreement. From her perspective, she saw rhetoric as a good introductory English class that everyone had to take, but “because the rhetoric that’s put around it is so negative, people do not value the work we do.” There was a real sense that Dietrich courses were seen as unimportant throw-away classes. These frustrations around the feeling that Dietrich was just seen as a “service college” proved indicative of a broader goal that students and faculty had — they wanted to define what it meant to be a Dietrich student and what their ideal community would look like. Some, such as Director of the Humanities Scholars Program and adjunct professor of history Timothy Haggerty, advocated for dedicated shared spaces for humanities students. Other students voiced preferences for more linear sets of classes that students from the same major would take together over semesters. These steps would help define for students who is in their community and who they can collaborate with rather than feeling adrift both in and outside the classroom. “It’s students’ belief that we have the crappiest building, with the crappiest classrooms,” as one professor put it. According to Dean Scheines, next summer the Tepper School will be making space available in other academic buildings as they move into the Tepper Quad. He states that one of the plans for this is to provide humanities majors with collaborative learning spaces. The last time Dietrich had a new building was in 1912. Professor Danks then described the effect that Carnegie Mellon has had on his work. He explains how using more data-based techniques have “provided new opportunities for research,” but that it’s “come at some cost to me, both personally and professionally... a lot of people struggle with those kinds of compromises.” When the Dietrich community envisions what the humanities ought to be, he pointed out the internal conflict of incorporating non-humanities disciplines while maintaining Dietrich’s identity as a college for humanities. One faculty member later stated that for Dietrich’s struggle for a sense of community, “the solution might be less trying to change how Carnegie Mellon sees us and more trying [to] change how the world sees us.” While this discussion had mainly focused on how to make the rest of Carnegie Mellon value Dietrich, she contended that the college’s real goal was to make the world see them, and therefore the humanities, as important. To her, the rhetoric around Dietrich won’t change until this happens first. “The issue to me is more about how we see ourselves... I think the self-conception of people of their fields is what we want. We want people in humanities to be proud of their work,” said Flickinger as the town hall concluded. Emma Flickinger is also a contributing editor to The Tartan.